Claire is in summer school this month. I know, mean ol’ me forcing Claire to miss out on the traditional joys of a care-free summer break! To be fair, this program is more of a transition jump-start than remedial academic help. The students go on “missions” in which they have to follow clues to find designated spots in different classrooms and other school spaces (call this interactive tours for 100 kids in their new middle school that will eventually be crammed with 700+). They have relay races in which teams stand in front of lockers and take turns working the combinations (and apparently Claire is far from being the only incoming 7th grader who hasn’t quite mastered this skill yet). Biggest challenge: she’s riding the bus for the first time. I know, the bus! What am I thinking?! First I put her in public school and now I put her on the bus?! Now you know I’ve lost it. Here’s what I was thinking. Pick-up at her elementary school was the most difficult concern for Claire on almost any day. She would make trips to the nurse at 10 a.m. because she got herself so worked up about whether or not I’d be standing at the right door after school at 4 p.m. Some mornings she was already crying before school thinking about the afternoon plan. We tried different approaches – from ignoring her to arriving 15+ minutes early to be sure she could see us from the classroom window – but none of it was fail proof emotionally. So when the middle school open house presentation said bus service would be available for summer school, I thought we had nothing to lose. The grandmothers might have panicked a little (although they are good at playing it cool), but I thought we had to try something different from what we had done so far, especially since middle school parent pick-up is a much more congested and chaotic process than elementary school pick-up. This year Jesse weaved his own way through bus lines, rowdy students, and a busy parking lot to get to wherever I had found an open parking space. I couldn’t see that same scenario working for Claire. I also thought Claire might see the bus as a fixture of transportation reliability. What is always there when you walk out of school? The school bus line. What isn’t always there when you walk out of school? Your parent (NOTE: We were late or not within sight a total of three times the entire year, but it left a mark). This week I watched her bus driver move a kid to a different seat so that Claire could have the one in the very front. I didn’t ask her to do that, but I was very pleased to see it happen. Can being a public school bus driver be a gift to the world? I think, yes! The bus stop is just a block from our home; from it she can see our van in its parking space. She’s currently working up the bravery to walk home on her own. She’s just waiting for me to get her a key to the front door. (WHAT?!) And I’m so proud of her. 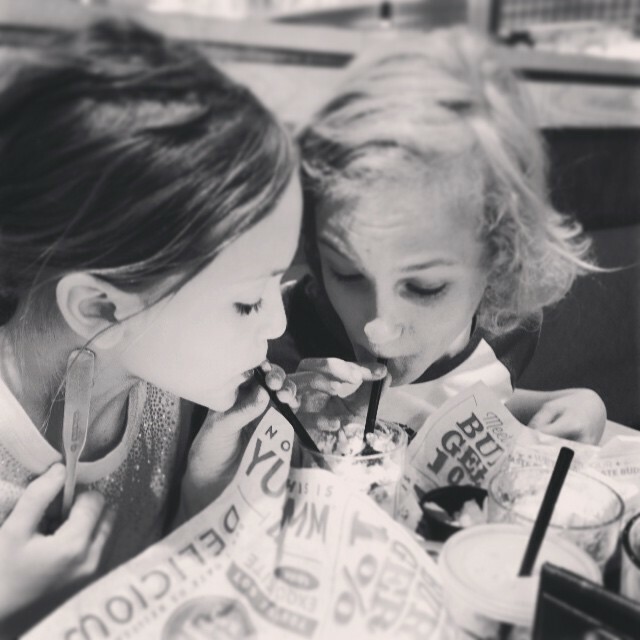 Since she’s started summer school, it’s been like watching her grow-up through that iPhone super speed filter. What I’m doing, in some ways, is setting her up to not need me. It would have been easier in a lot of ways to drive her to and from summer school. But learning to ride a bus is making her braver. I’ve read stories about New York kids who take the subways to and from dentist appointments in the middle of the school days.The SUBWAY! 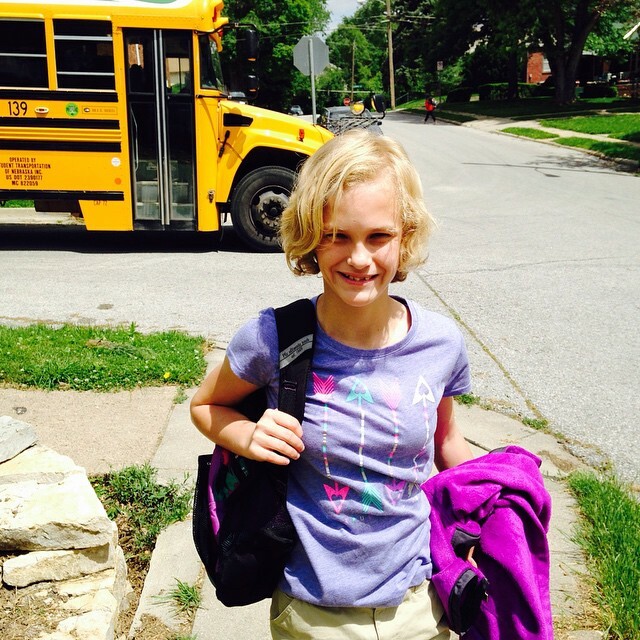 What if learning to ride the bus gives Claire a freedom she might not otherwise have? Can I overcome my own fears so that she can enjoy that? I’m not sure either of us has the nerve for her to get her driver’s license. A school bus today could be the city bus tomorrow. She could learn to ride to high school, work maybe. I don’t know what her future looks like. I just don’t want to get in the way. If I truly want her to be brave when facing the world, I probably need to start by being brave myself, which sometimes means doing less so that she can do more. Great insight! I’m learning little by little with my own kids that we all have set ideas and pretenses that change by the character of our children. Thanks for sharing your fears and wisdom! Should. Not. Have. Read this while working the front desk. Trying to hold it together. So proud of both of you. I love this! You are both brave young women to face this new challenge and soar! Thanks, Judy. We’re working at it! Beyond the Claireness of it all, and the teaching them not to need us thing, my favorite part is the bus driver being a gift to the world. I wish giving that award was my JOB!